Collapse is an installation created in response to the global crisis occurring in the world's fisheries and the current threat for the unraveling of the Gulf of Mexico's food chain following the 2010 BP Deepwater Horizon oil spill. This large-scale installation, a pyramid display of hundreds of preserved fish and other aquatic organisms in gallon jars, recalls the fragile interrelationships between Gulf species. Empty containers represent species in decline or those already lost the extinction. Brandon Ballengée created Collapse in collaboration with Todd Gardner, Jack Rudloe, Brian Schiering, and Peter Warny. Also on view is Ghosts of the Gulf, a series of prints made from scans of chemically cleared and stained specimens collected in the Gulf of Mexico after the 2010 BP Deepwater Horizon oil spill. The species depicted and numerous others may be in decline. The prints are meant to be seen as apparitions. The chemical process of clearing and staining specimens involves multiple steps, revealing the complex architectural anatomy of these beautiful species. Although the images look like brightly colored X-rays, Ballengée actually scanned each chemically altered specimen millimeter by millimeter to make detailed recordings. He then assembled the layers in Photoshop to create the final artworks. 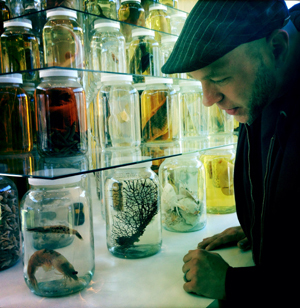 Brandon Ballengée is a visual artist, biologist, and environmental educator based in New York. Ballengée creates trans-disciplinary artworks inspired from his ecological field and laboratory research. Since 2009, he has been a visiting scientist at McGill University in Montreal and currently is also a professor at the School of Visual Arts in New York City teaching in the Fine Arts Department, the Humanities and Sciences Department and Honors Program. Hear Brandon Ballengée speak and see the exhibition on December 11, 2014 at the D.C. Art Science Evening Rendezvous. For more information, please see the Collapse downloadable appendix and visit Brandon Ballengée's website.